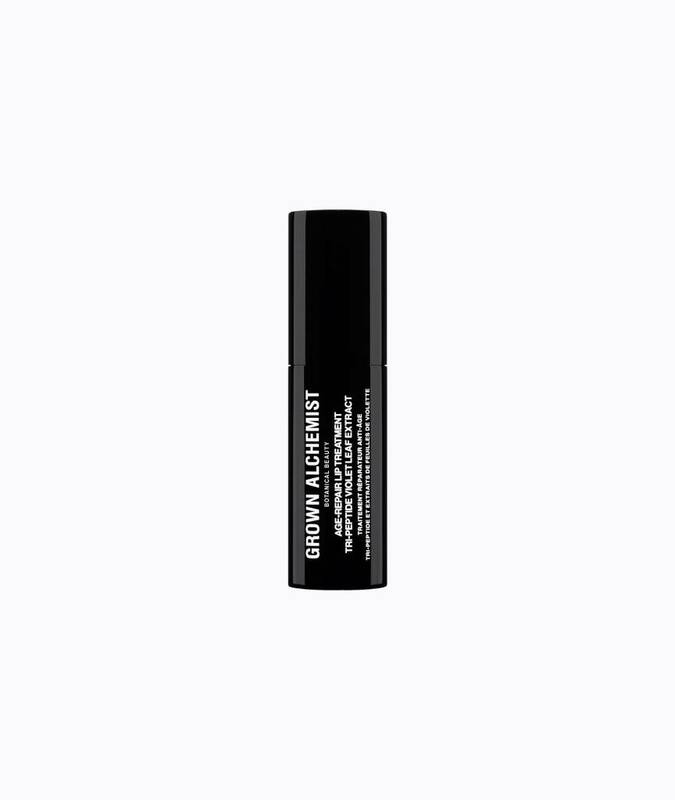 Grown Alchemist's new Age Repair Lip Treatment noticeably hydrates, conditions lips while visibly increasing volume, refining the lip-line and reducing fine lines, on and around the lip contour. Tri-peptides stimulate collagen and hyaluronic acid production noticeably increasing lip volume, reducing surface folds and fine lines leaving lips looking full, smooth and moisturized. violet leaf extract provides rutin, salicylate and flavonoid Antioxidants that provide antiseptic and healing properties leaving skin looking healthy and clear. triglycerides from shea butter protect from moisture loss while naturally hydrating the lips, transforming dry and chapped lip texture. Apply evenly over lips for increased volume, instant anti-aging and conditioning benefits, use as often as desired. Simmondsia Chinensis (Jojoba) Seed Oil, Octyldodecyl Stearoyl Stearate (Plant), Octyldodecanol (Plant), Euphorbia Cerifera (Candelilla) Wax, Polyglyceryl-3 Diisostearate (Plant), Copernicia Cerifera (Carnauba) Wax, Cera Alba (Beeswax), Hydrogenated (Jojoba) Oil, Irvingia Gabonensis (Kernel Butter), Butyrospermum Parkii (Shea Butter), Ethylhexyl Palmitate (Plant), Hydrogenated Coco-Glycerides (Coconut) Oil, Tribehenin (Plant), Pentaerythrityl Tetraisostearte (Plant), Sorbitan Isostearate (Plant), Helianthus Annuus (Sunflower) Seed Oil, Lactic Acid (Plant), Diethylhexyl Syringylidenemalonate, Caprylic/Capric Triglyceride (Plant), Benzyl Alcohol (Plant), Palmitoyl Tripeptide-1 (Tri-Peptide), Viola Tricolor (Violet) Extract, Citric Acid (Plant), Titanium Dioxide (Mineral).